It takes more than fifty volunteers, two months of hard work, thousands of dollars and more importantly a commitment to put together a successful large scale event. This success formula is what precisely has TAMA followed once again in celebrating "TAMA Divya Deepavali" Celebration on the evening of Saturday, November 16 at Norcross High School. Everything was meticulously planned and executed right from choosing the programs to providing a sumptuous dinner... In simple terms it was a mission accomplished! Planned, crafted and executed by TAMA EC Team and a few volunteers, the backdrop decoration depicting Deepavali Fireworks was par excellence. Program line up - an excellent combination of music, dances and plays - has reflected a sea change in quality of presentation. Several choreographer and coordinators have done a great job of preparing young artists for the show. The sold-out event started with a welcome note by Cultural Secretary Vijay Ravilla. MC of the evening Srivalli Kondur coordinate the program segment of local artists. An invocation song "Gananayaka Ganadaivataya" by a little wonderkid Manomay marked the inauguration of cultural programs. A few film songs "Aaraduguluntada", "Andamga lena" rendered by Anjali Botcha, Saahiti Boddireddy, Sameeksha Boddireddy, Rashmi Kondur, Shriya Kondur and Srivalli Kondur. "Yedunnado Navvula", a folk song by Janardhan Pannela was very refreshing. One of the highlights of the evening was an apt mythological play "Sri Krishna Satya" . This nicely-executed masterpiece was the concept of Aparna Turaga of Sri Dutt Raga Fine Arts - Artists were Akhil Turaga, Santhosh Pisike, Rohan Aluri, Karthik EnaganTi, Ajit Nag Turaga, Manvit Kolli, Aryan Aluri, Lahari Pisike, Manasvi Kolli, Asha Palacherla, Kavya EnaganTi, Ishna Kommineni, Siddhardh Paradarmi and Suvarna Kommineni. 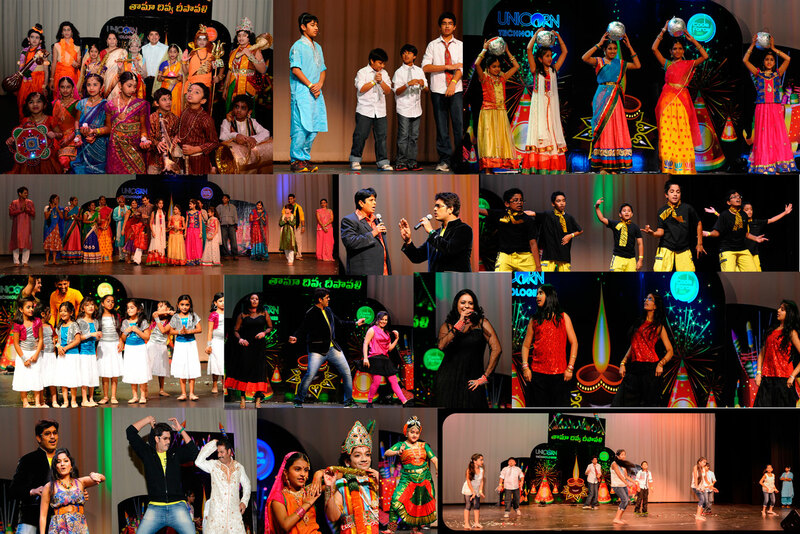 This play truly educated the kids about the story behind Deepavali Festival. Sridevi Dadithota presented an excellent classical dance in which the dancer offers her prayers and salutations to Lord Ganesha, seeking his blessings. Dance medleys choreographed by Radhika Vangapally was very interesting. Lungi Dance by students of Shiva Dance Academy stole the show like always. Another dance medley by Pran Sharma Gangaraju was applauded by audience. Fusion Dance - Mix of Tollywood and Classical dance added variety to the evening's program. The last item before the floor was handed over to Guest Artists from India "Reliving glory of Tollywood and its Contribution to 100 Years of Indian Cinema" received great response. Several artists portrayed roles of film heros like NTR, ANR, Krishna, Chiranjeevi, Venkatesh, Jamuna, Savitri, Jayaprada, etc. Another unique item, planned and coordinated by Rajesh Adama was a Game Show replicating Omkar's "Challenge". The show was well received by audience as it was very visually attractive and the young artists have presented accurately by syncing the background voice of Omkar, Shivshankar Master and Rajashaker Master. Artists were Disha Adama, Rakshita Adama, Srihita Padamatinti, Shreyas Padamatinti, Sahil Posa, Akhil Posa, Sreechal Pawar and Nischal Pawar. An extraordinary combination of celebrity talent from India - TV Soap Hero Indraneel, Comedian Hari Babu, Singer Krishna Chaitanya and Dancer-actresses Madhavi Latha, Revathi Chowdari and Pop Singer Madhoo - rocked the stage for about one hour with their dances, mimicry, comedy skits and many other entertainment feats. Indraneel, the favorite serial hero for millions of TV viewers presented a classical dance as a curtain-raiser to Tollywood segment of the evening. Madhoo, Desi Girl song fame, entertained the audience by mimicking Lakshmi Manchu a Telugu Actress & Producer and Rashmi, brother of Jaganmohan Reddy. Comedy skits Haribabu and Indraneel evoked bellyful Several Prizes, sponsored by K.B. Zaveree, Swapna Indian Cuisine, Sri Krishna Vilas, Jai Hind and Sampra Soft were distributed to the winners of raffle. Earlier Mahesh Pawar, President of TAMA greeted and thanked the audience for their continued encouragement. The event was wrapped up by a fitting tribute to the artists. Plaques were presented to Artists from India by Sunil Shavale and Srinivas Lavu, Chairman of TAMA Board. The event was sponsored by Unicorn Technologies and Code Force. The event video and photography was covered by Sridhar Vakiti of Vakiti Creations. Snacks were sold by Nilgiri's Bakery & Cafe, Alpharetta. Very tasty and hot dinner was served by Taste of India Restaurant, Alpharetta. Volunteers who made the program successful are: Ram Maddi, Venkat Meesala, Rajesh Jampala, Nanda Chatla, Rakesh Gudimalla, Subbu Rao maddali, Manya kothapalli, Rajesh Yellabandi, Raju Mandapati, Shyam Mallavarapu, Kiran Gogeneni, Praveen Tirumalasetti, Manoj Tatikonda, Krishna Chaitanya Tatikonda, Sandeep beegala, Srinivas Gundarapu, Rajesh Allagandula, Syam Pothini, Goutham Gurram, Murali Kakumani, Rajesh Jampala, Mallik Medarametla, Arun Vuyyuru, Sunil Savele. Please forgive us if we missed any volunteer names. TAMA thanks the following volunteers who helped in the making of beautiful backdrop on the stage. Vijay Gandhapodi, Vinay Maddineni, Kiran Gogeneni, Shyam Mallavarapu, Anil Boddireddy, Raju Mandapati, Chittari Pabba, Sri Harsha Yerneni and Venkat Meesala. Note: Due to time constraint TAMA could not do the Raffle for the online tickets. We are planning to do at Paramount Software - TAMA Super Singer First Round on Dec 1st at Ivy League Academy. Winners will be anounced through their registered emails and TAMA newsletter. .